Ah, Spring is in the air! And with Easter being this weekend, so is Spring entertaining. I love to entertain and host but pulling together a beautiful tablescape can feel a bit daunting at times. That's why I am breaking down exactly how to achieve this Spring table setting. Whenever I am dreaming up a tablescape, I like to think about the basics: my theme and colors, the main centerpiece, what dishes, silverware and glassware I want to use, and linens (table cloth, table runner, napkins, etc). Once you have those basics nailed down, then you can get creative with all the fun accessories. I also try to use as many items that I have hand as possible, while mixing in some seasonal items I can shop for online, in an antique store or that I can find at the local store. The first step is to lay your table runner down and put the wooden tray on top. Gather all of your glass bottles and put them down the center of your wooden tray. Next you will arrange your assorted Spring flowers. I clustered the flowers together according to color so all of the white flowers were mixed together and all of the yellow. Just cut 1/2 in. 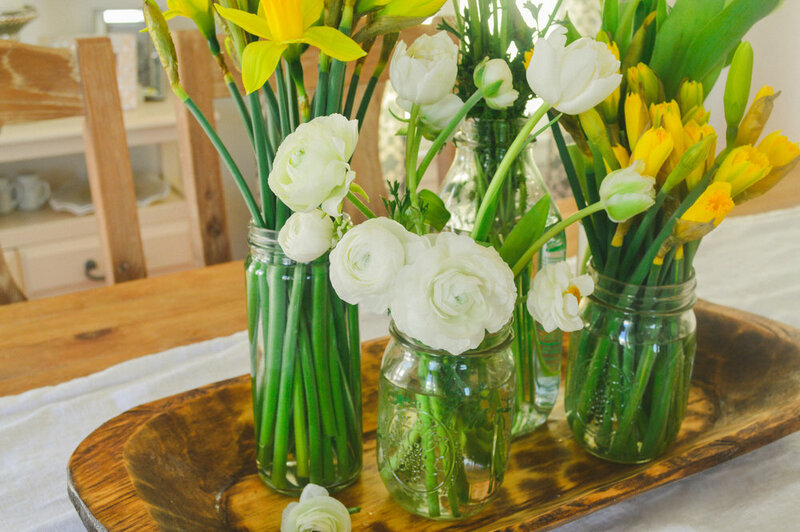 off the bottoms of the stems, add water to the vases/jars and arrange them however you'd like. The second Step is to actually set the table starting with laying down your chargers on the bottom and layering on your plates and bowls depending on how many courses you will be serving. On top of the plate, place your napkin and 1 sprig of thyme. Lastly, add your utensils and glassware. I am serving mimosa's so I used crystal goblets. I am only serving 1 main course, so I only needed 1 plate and 1 fork and knife but set your table accordingly. The third step is to add any of your accessories. Here I added a little drink caddy with mixed juices for the mimosa's and a coffee canister. Depending on your menu, you could add a basket of assorted breads and pastries with a cute butter dish and jams. Use your imagination and make it your own! One thing I try to stay away from is adding too much clutter to the table since you want your guests to feel comfortable and not overcrowded. 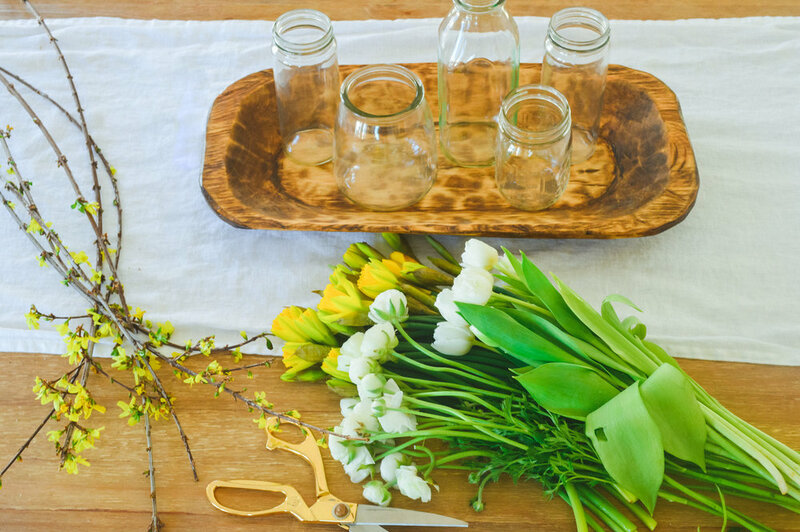 I hope these tips are helpful to you as you go about setting your tables for Spring! I would love to see your tables, so be sure to tag me on Instagram!